Allows verifying whether the urine sample has been counterfeited through Creatinine, Ph, Nitrites, Glutaraldehyde, specific gravity (viscosity of the urine sample), oxidants and bleach. Each plastic strip contains six (6) chemical reacting swabs. 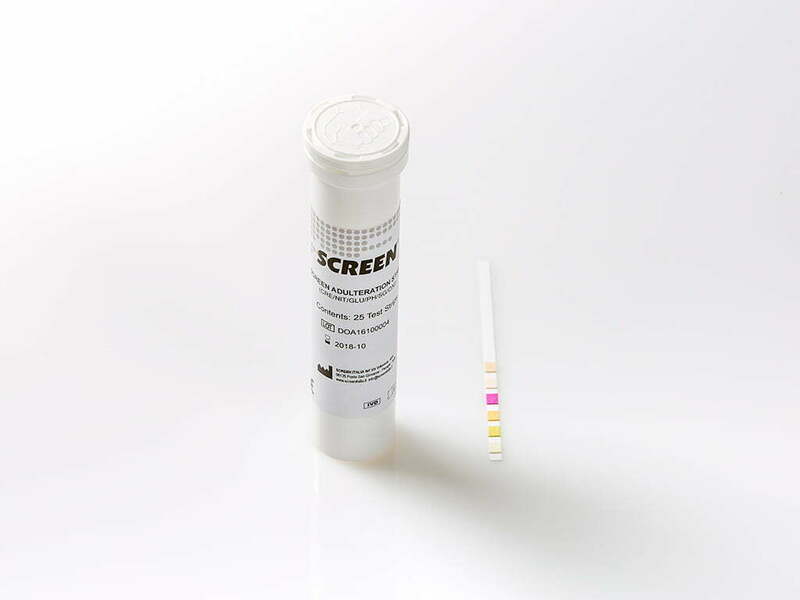 After one (1) minute from the activation of the reacting swabs with the urine sample is possible to compare the colours appearing on them with the colour chart on the bottle. Comparing these colours, you will get a semi-quantitative result of the values of creatinine, nitrites, glutaraldehyde, Ph, specific gravity and oxidants/ pyridinium chlorochromate (PCC) in the human urine, useful to determine the sample’s integrity.